Mauna Loa, literally long mountain, is the most massive mountain in the world, and the world’s largest volcano. It’s actually difficult to locate on the island because it’s just so big that it looks more like a low hill. A few hundred feet below its neighbor Mauna Kea, this mountain has an entirely different character. It’s also a much wilder mountain with less of a safety net if things go wrong. 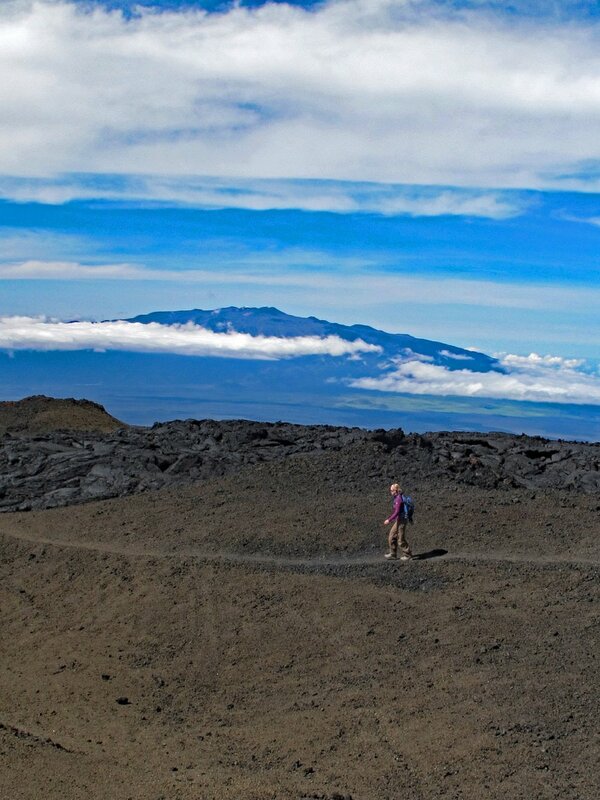 There are two ways to climb to the summit of Mauna Loa. The one described here requires no permits, but is a difficult day hike. The other begins inside Hawai’i Volcanoes National Park and requires a 30+ mile slog that begins in tropical rainforest. This route requires at least 3-5 days. Contact the National Park for a permit and all the info you’ll need for this serious backpack. The route described here begins at the Mauna Loa Observatory, a premier atmospheric research facility that has been continuously monitoring and collecting data related to atmospheric change since the 1950's. The undisturbed air, remote location, and minimal influences of vegetation and human activity at MLO are ideal for monitoring constituents in the atmosphere that can cause climate change. You’ll be parking in a lot that’s offset from the climate monitoring gear. While it’s a very, very good idea to hang out here to adjust to the altitude before hiking, do not idle your vehicle. The fumes from your vehicle could interfere with the precise instruments of the observatory. This trail is gradual and easy from a technical perspective, but can be quite tough on the body. Much of the hiking is on loose lava fields, and if you hike all the way to the summit, you’ll surely feel the accumulated mileage of the day on your joints due to slogging on the impossibly hard lava. Plan for a nice day in the ocean after this one. Trailhead: from either side of the island, take the Saddle Road, Hwy. 200, to the Mauna Loa Observatory Road, between the 27 and 28 mile markers on the Saddle Road. The road is well-marked. Follow this sometimes one-lane road for 17.5 miles to the parking area for hikers. The road is rough in many areas, but can be carefully negotiated by a passenger car. There is a white, squiggly line that marks the “center” of the road nearly the entire way that was painted by climate scientists to help when driving in the fog. It’s very funny. You might consider stopping periodically along this road to stave off the effects of AMS. If you keep your eye out, there are several appropriate places to pull your car off the road as you ascend. The trailhead elevation is 11,030 feet. There are no services of any kind including restrooms. Plan accordingly to Leave No Trace. Gear: You’ll need winter gear, sturdy boots, plenty of water, and extra food. This is a big, wild mountain. Treat it as such. Hike: This hike begins where the Observatory road ends. Follow the two-track, extremely rough 4WD road with small ʻaʻā lava that is like scree. Follow this road for 1/2 mile until you spot the sign for the Mauna Loa Observatory Trail. The intersection is well-marked, and the trail will begin on your left. The “trail” is mostly a series of cairns, or ahu, leading through alternating fields of ʻaʻā and pāhoehoe lava. Most of the cairns are quite large, intended to aid navigation in fog. It’s usually a good idea to spot the next cairn before leaving the last, but it’s an even better idea to use your map and compass. The steepest portion of this hike is the beginning. It’s almost 4 miles to Moku’āweoweo, the summit caldera (but not the actual summit). After a mile, you will reach large, broken lava tube marked by two extremely large cairns. This short, collapsed tube is worth a quick stop. After 1.5 miles from leaving the 4WD road, you will reach the signed border of Hawai’i Volcanoes National Park. This area is a mishmash of old roads and trails, some possibly hundreds of years old. The trail is relatively well-marked throughout, especially once within the Park, but it’s a very good idea to check your progress with map and compass. Just before you reach the summit rim, you will intersect the Mauna Loa Trail, which is the trail mentioned in the overview and which begins within the Park. Take care not to mistake this trail for your trail. Shortly after this intersection, find a whimsically-placed pit toilet over a large lava crack with perhaps the best view from the throne in the world. Within less than a tenth of a mile, find another intersection, where left goes toward the Mauna Loa Summit Cabin, part of the permitted hike from within the park mentioned in the overview. Right takes you along the Summit Trail, where it’s 2.23 miles to the actual summit. Look sharp in this area for a nice, deep open-ceiling shelter from the elements, and a wonderful place for lunch on a nice day or to hang on for dear life in an emergency. The 2 miles to the summit takes you over lots of unforgiving ʻaʻā lava fields, and the trail is maddeningly gradual with few views of the summit crater. Suddenly, you find yourself nearer to Moku’āweoweo, and you realize how much you’ve actually climbed from when you first reached the edge of the crater. The summit is marked by a large cairn. The view is absolutely staggering. Moku’āweoweo is too large for photos, too large for words. The immensity will leave you breathless. The large, colorful cone is from 1940, although some of the lava is from as recently as 1975.